Do you have a piece of furniture that doesn't quite "fit" into a room, but it has to stay? You're not alone. This scenario occurred on this project. 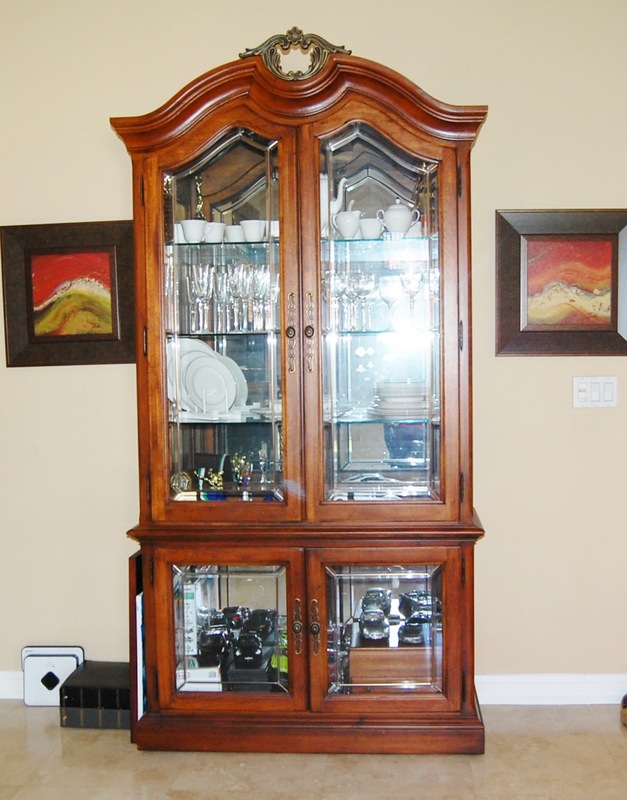 The client had a traditional china cabinet that I had to work around while assisting them with their casual family room space. The cabinet is formal and traditional - two characteristics that the subject space would NOT be. The client had previously moved it out of their dining room (to make way for a buffet cabinet), and it has since landed in various spots around their family room. Rather than having seldom or never used formal china and glassware on display, I suggested "dressing down" the cabinet's interior by incorporating less formal items. Some suggestions included: framed personal photos, books, photo albums, pottery/jars/vases, art, and modern decorative accents (sculptural brass for instance). Potted greenery, whether a real or faux plant, would inject some "life" and dimension. Including a couple of woven baskets would also "break up" some of the paned glass while infusing some depth and texture. Baskets are also great for storage and hiding the not-so-pretty. While you can't change the general traditionalism of the cabinet, swapping out the handles with something more modern would help minimize the traditional character. The lesson here is to think outside the box when having to work your way around something not ideal within a space. Consider alternative uses for the piece. 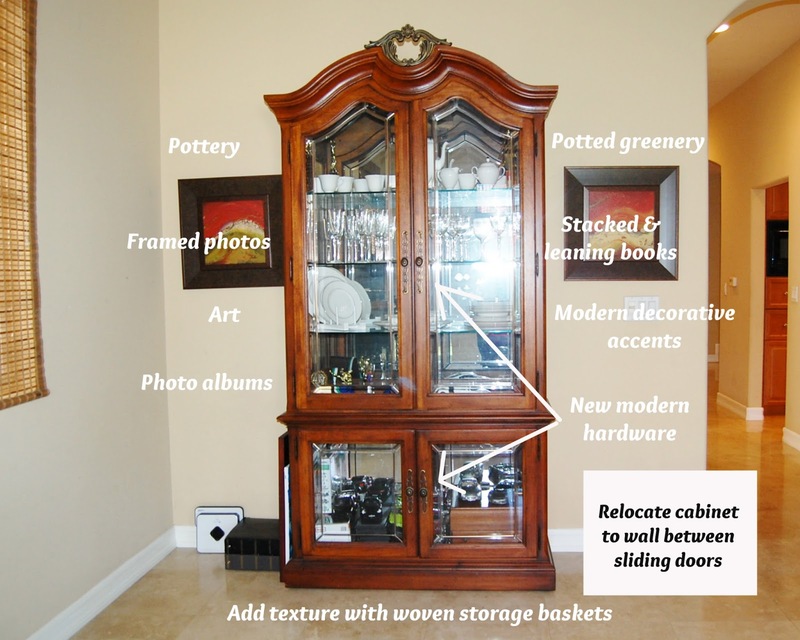 In this project, the china cabinet was used more as a bookcase instead of its intended purpose. 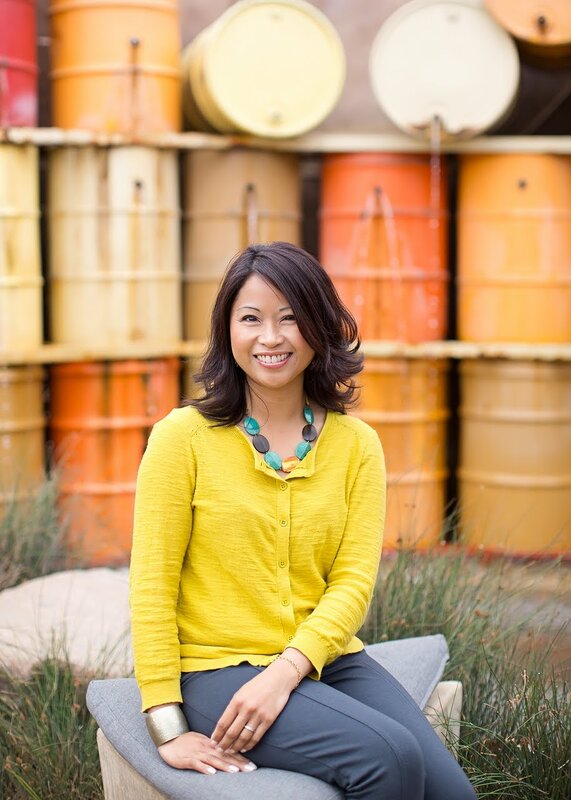 The best part is that the items I recommended for styling the cabinet were things that she already had on-hand. Some of you may also be wondering if I would suggest painting the wood. My response to that would be sure, if it wasn't valuable or made of real wood. In this case, their cabinet was very expensive and I believe made of glass and solid wood. I didn't want to compromise the possible value of the piece if they did try to sell it later. I also typically prefer to keep the original integrity of real wood, especially when it's in great condition.